Flaunt smooth curves and sleek silhouettes in all your slim-fitting outfits with our women's shapewear range. We have a huge assortment of body shaping items to suit every body size and shape. Browse our range of shapewear today to get the silhouette you've been looking for! 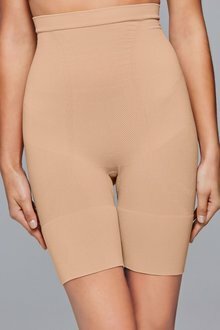 Ideal for tight-fitting sweaters, jumpsuits or dresses, our shapewear will help you step out in confidence, every day. Our shapewear comes with smoothing panels that offer control and shape without compromising on comfort, along with flat seams to ensure a line-free look. Are you looking for some seductive shapewear for the boudoir or something more comfortable for everyday wear? Our women's shapewear comes in a range of styles, from bodysuits to briefs, camisoles to control slips, and so much more. Use our Lingerie Guide to find the shapewear style to suit your figure! And when you've found what you need, shop our range of women's shapewear online to make the most of our fast delivery and 30 day returns policy!